London shopping - shops with clothes, shoes, vintage, music, markets and much more. In London you can probably shop for the most things. If have you been to New York and Paris, you'll recognize yourself! If you want to shop clothes you can shop for classical, street, vintage, and of course sewing your own clothes. On this page we have gathered some bits and pieces on various shopping sites for different things. Are you in the central parts of London and want to buy everything possible, get to Oxford Street and then to the Mayfair. 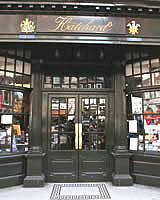 Soho and Covent Garden also have several different stores. Want to buy vintage, go to the east of London. 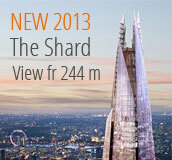 Want to buy even more exlusive go to New Bond Street. Some electronics products are available at Tottenham Court Road. In Hatton Garden, you can buy jewelry. Go to Notting Hill where there are many streets and shops and markets. Some of the biggest department stores! 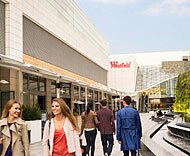 Want to buy luxury or just walk around and have a look, take a visit to an exlusive department store. If you are in London in January - you are lucky - because then it's usually the big January-SALE. Harrods is a must, here you can buy EVERYTHING! 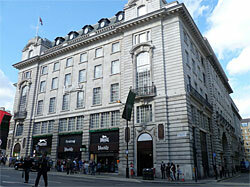 Harrods was founded in 1834 by Charles Harrod. Harrods in 1882 burned down and they built a new store at the current location. Harrods is the biggest department store in Europe. Please note that Harrods might have requirements on how you dress to get into the shop. Harrods is famous for its Food Halls and their specal Christmas department during Christmas time. Harvey Nichols opened in 1813 by Benjamin Harvery. In 1820 he went into partnership with Colonel Nichols. You can buy nearly everything here. 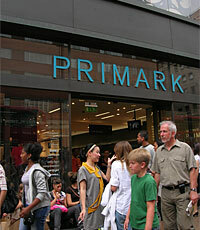 At Primark you can shop for clothes at very low prices. Do not expect high quality goods, but sometimes you can find bargains. Also some organic garments - but then you need to really look! Be prepared for a little panic feeling when you walk in the store - usually, it is many people at the same time. The clothes are in piles and it can be difficult to find anything in the big pile of clothes. But as always, it's fun! Good clothes at good prices. Here you will find everything, clothes, bags, shoes and accessories for the younger audience. The stores are a cross between H & M and Top Shop. The store that sells cheap and trendy clothes for young people. Maybe not as hysterical as Primark. Has shoes. 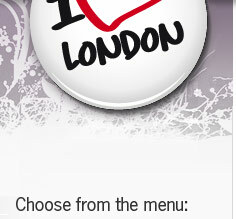 Several places: Victoria, Oxford Circus, Oxford Street...and more. Here you can find designer clothes at great prices. The stores have outlet prices. Perhaps it can be compared with Century 21 in New York. In this store, you will spend several hours. Here you can buy the basics to the finest dresses. Also vintage clothing. 400 Oxford Street, Unit 18, Cardinal Place, 60/64 The Strand. At Next you will find affordable trendy clothing for both men, women and children. Footwear, sportswear, furnishings and electronics. What is super is that there is a special section for those of you who are tall. 201 - 203 Oxford Street, located at several places. Shop for you who want to find clothes that no one but you will wear. Sure, it costs a bit. Visit the vintage store that even Kate Moss visits now and then. If you like Rock'n roll and other music from bygone times but also today's music. Here you will find a lot of t-shirts with cool prints and tops for women, men and children. "B Famous is a rock n roll boutique selling 100% official merchandise such as fashionable t-shirts from Amplified, souvenir mugs, miniature guitars for collectors. They range from Led Zeppelin to Rolling Stones from 60's. We target all ages from 0 as we hold products for mini-rockers. You always welcome to our vibrant boutique for quality shopping if not for a little chat All The Best." There are both men's and women's shoes at good prices and good quality. 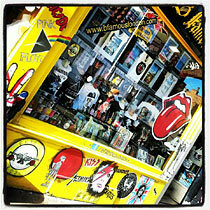 190 Oxford Street, 16 Carnaby Street, located at several places in London. A great department store filled with food and drink. 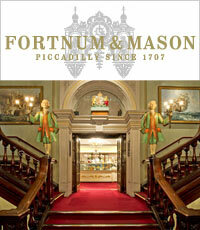 Already 300 years ago the store opened at the same address as it stands today, 181 Piccadilly, near Piccadilly Circus. You can find cheese, tea, coffee, chocolate, fish, meat, bread, pastry and wine and much more. Besides food there are gifts, perfume, books, crockery and a christmas shop. And if you do not want to go shopping why not pop in for an afternoon tea., On March 1, 2012 Queen Elizabeth officially opened the new tea room that was named The Diamond Jubilee Tea Salon. If you do not feel like beeing squeezed in the center of Oxford Street and Piccadilly. Take the subway Central Line - to station: Shepherd's Bush and White City. When you come out from the tube the shopping center is to the left of you. Here you have about 265 stores under one roof from 15 different countries. One of London's oldest bookstore, but not the biggest. Opened in 1797. Looking for a book, you will certainly find it here. English Excellent service! Bargain in this sports shop located at Piccadilly. Several floors with everything in walking, sportswear, footwear for men, women and children. Fairly good prices with great range. If you want to shop some music, games, etc - go to HMV. They sell movies and music and TV -series in all genres.